Today El Universal reports there were 13,500 murders in Venezuela in 2003. It’s a staggering number. Let’s put it in perspective. The figure is three times higher than the 4,300 murders in 1998, the year before Chavez took office. The murder rate has tripled, from 19 per 100,000 inhabitants to 59 per 100,000, just in the last five years. Murder is over seven times as common today as it was in 1988. Internationally, Venezuela has left behind even notorious South Africa in the league tables. Only war-torn Colombia has a consistently higher murder rate than Venezuela. Interestingly, in Colombia and South Africa the murder rate has been falling in recent years. 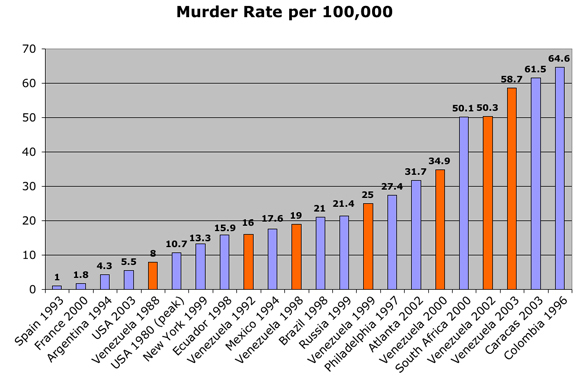 Venezuela is the only country towards the top of this table that has a rapidly-growing murder rate. Venezuela’s murder rate is now between 3 and 4 times that of other countries in the region like Ecuador and Brazil. 15 years ago, our murder rate was roughly comparable to that of the US. Today, it’s over 10 times higher. One final, shocking basis for comparison. According to the tally kept by the Iraq Body Count project, between 8,000 and 10,000 civilians have been killed in the guerrilla war in Iraq over the last year. Iraq has a population roughly comparable to Venezuela – meaning a Venezuelan is more likely to be killed by street violence than an Iraqi is to die in the insurgency. Source: a dozen separate webpages I found through Google. Disturbingly, 2,000 people died in “shootouts with the police” last year. As you know, “shootout with the police” is often – not always, but often – the excuse police death squads use after killing suspects in cold blood. The government continues to more or less ignore this problem. There’s no time! They have a revolution to run!